Accelerated B.S.N. students participate in the rite of passage. Stacia Moreno, a student in the accelerated B.S.N. program, shakes the hand of Mary Jean Schumann, the School of Nursing's interim senior associate dean, during Thursday's White Coat ceremony. Stacia Moreno beamed with pride as a faculty member cloaked her with a white lab coat at the George Washington University’s Virginia Science and Technology Campus on Thursday evening. 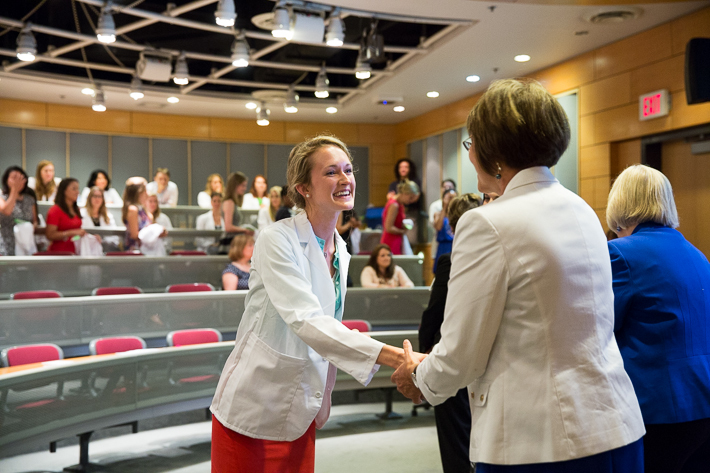 “I’m just so excited,” she said while shaking School of Nursing Dean Jean Johnson’s hand. Ms. Moreno was among 62 students in the School of Nursing’s accelerated Bachelor of Science in Nursing (B.S.N.) program who participated in the school’s inaugural White Coat Ceremony. 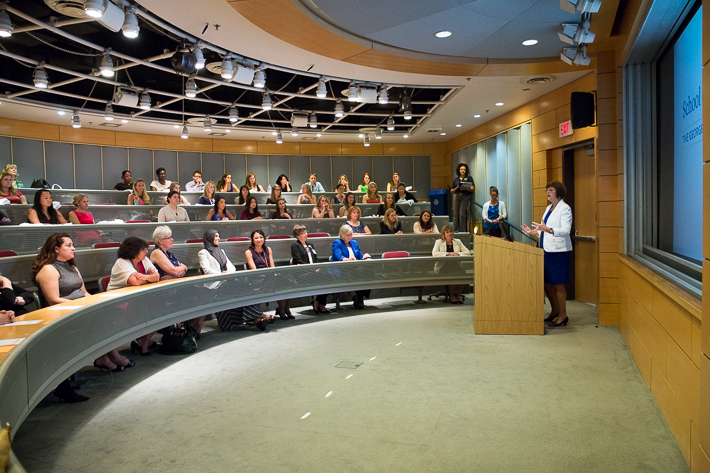 The Arnold P. Gold Foundation (APGF) and the American Association of Colleges of Nursing (AANC) provided funding for 100 nursing schools, including GW SON, to pilot similar events around the country. 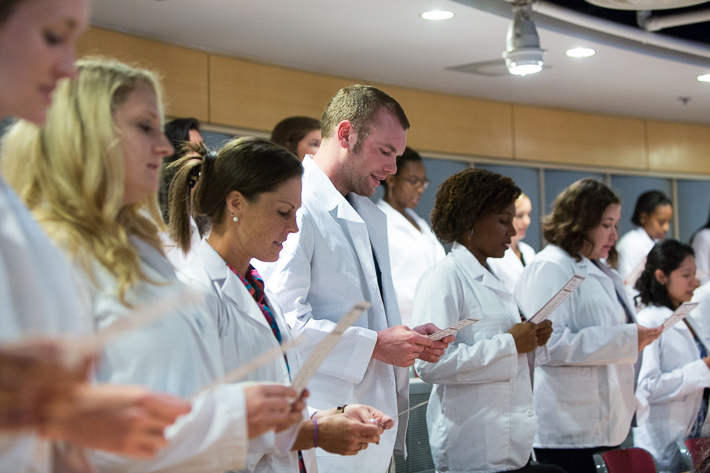 While White Coat Ceremonies have been a rite of passage at medical schools for more than 20 years, marking students’ initiation into their profession, schools of nursing have rarely held similar traditions. 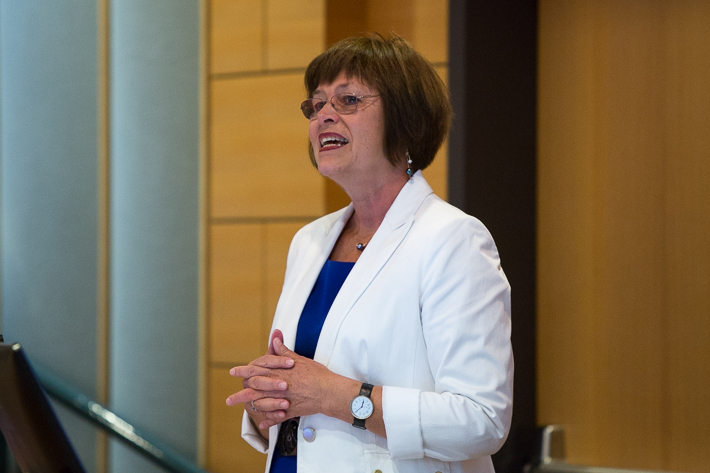 This year, APGF and AANC funded the inaugural ceremonies in an effort to send a message to new nursing students that compassionate care must be a hallmark of their clinical practice, AACN President Eileen T. Breslin said in a released statement. 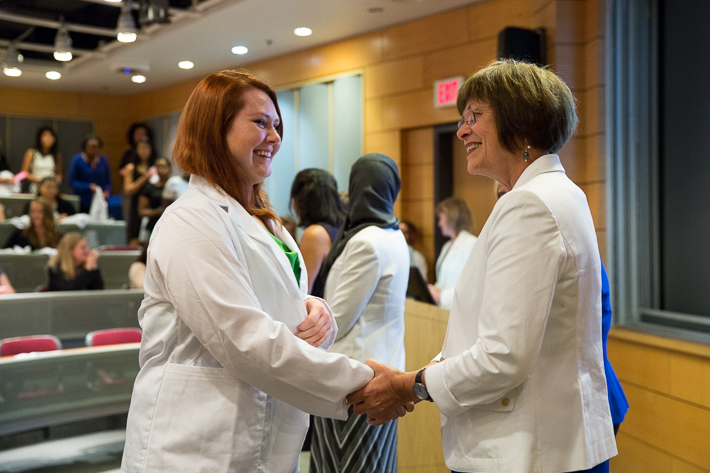 The GW School of Nursing plans to make the White Coat Ceremony an annual event, Dr. Johnson said in her address to students on Thursday. 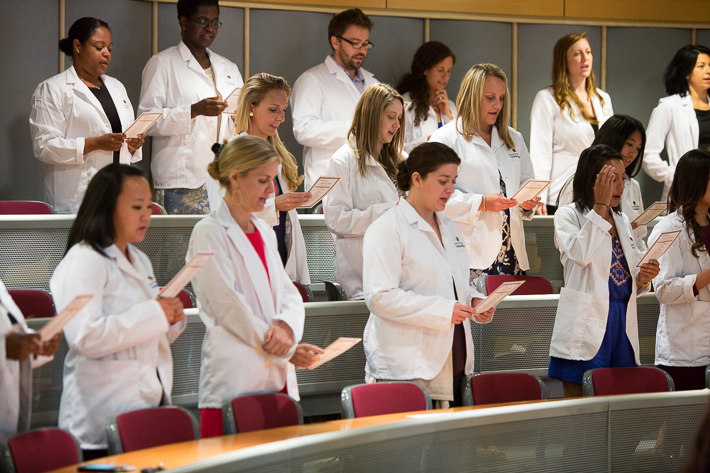 Nursing students recite the ceremonial oath during Thursday's ceremony. The nursing students completed their first exam at 8 a.m. Thursday, and they will enter their various clinical sites this week. GW’s intensive, 15-month accelerated B.S.N. program is intended for students who already have a bachelor’s degree in a non-nursing field. In addition to taking nursing courses and experiencing the Skills and Simulation Laboratory, students are placed in clinical training locations throughout the duration of the program. For many students, who came from a variety of non-nursing fields, the White Coat Ceremony marked the start of a career transition. Before attending GW, Ms. Moreno was a researcher with the Navy. This week she will start her clinical training at Holy Cross Hospital in Silver Spring, Md. “I am anxious but looking forward to the new endeavor,” Ms. Moreno said. Dr. Johnson called clinical training the “heart and soul” of nursing education, but she reminded students that it does not come without a unique set of challenges. She reflected on her first clinical experience as a nursing student when she was assigned to an 18-year-old patient who had severed his spine. As Dr. Johnson tried to care for her patient, he responded with anger and frustration—so much so, that Dr. Johnson considered giving up on nursing. With the support of her instructors and fellow classmates, she pushed through, helping the high school senior to recover over the course of the semester. While doubts and fears are a typical part of clinical practice, the rewards of nursing are overwhelming, Dr. Johnson said. Dr. Schumann also stressed the importance of the nurse-patient relationship. 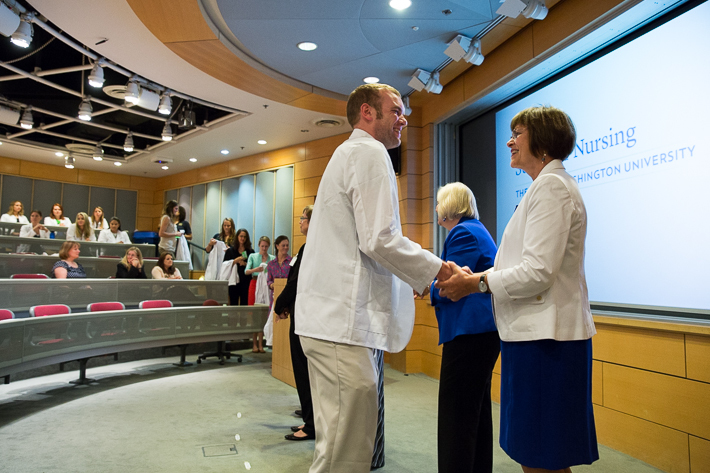 The white coat, she said, symbolizes the future nurses’ commitment to their patients. First-year M.D. students were welcomed to the School of Medicine and Health Sciences during a White Coat and Honor Code Ceremony in August, students in the physician assistant program received their white coats in September and physical therapy students will be honored later this month. 62 students in the School of Nursing's accelerated B.S.N. 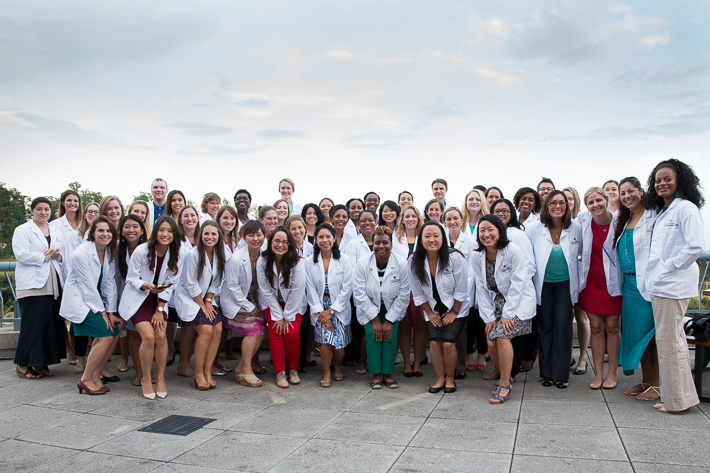 program participated in the White Coat ceremony in Exploration Hall at GW's Virginia Science and Technology campus. A student shakes the hand of School of Nursing Dean Jean Johnson. 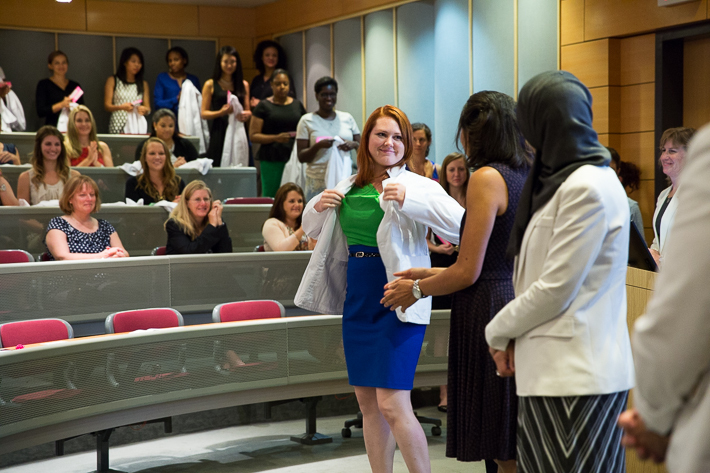 A student receives her white coat on Thursday. School of Nursing Dean Jean Johnson addresses students at the White Coat ceremony. "You won't know the impact you'll have on people's lives," she told them. “That’s what drew us to nursing in the first place—thinking that we can make a difference. And you can," School of Nursing Dean Jean Johnson said.